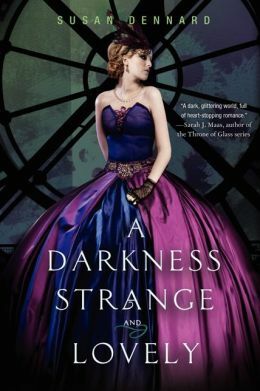 The title of Susan Dennard’s A Darkness Strange and Lovely essentially sums up my literary experience of this enriching sequel. While I read her first book, Something Strange and Deadly, and thoroughly enjoyed it, I knew at the end that there was much to be explored and I found myself waiting on tenterhooks for Part II! Luckily my patience was rewarded with a book that takes the main elements of the series, which made it so engaging: an individual zombie lore, textured 19th century history, an ethnically and motivationally diverse cast of characters, and a strong heroine, and ratcheted the tension up a few notches. A Darkness Strange and Lovely begins with Eleanor Fitt’s life in tatters. She’s been shunned from Philadelphia society, has sold off all of her family’s heirlooms to pay for her mother’s mental asylum, her brother’s dead body is being possessed by the evil necromancer Marcus, and the only people who understood her have fled to Paris. While Eleanor’s spunky character and can-do attitude in the face of the unknown have always endeared me to her, it’s how she digs her way out of a seemingly hopeless situation that had me truly rooting for her this time. She’s never left Philadelphia, but has always dreamed of traveling the world, and when things go from bad to worse at home, Eleanor takes matters in to her own hands and decides to seek out the Spirit Hunters in France for answers. Along the way she encounters some intriguing new characters, including a demon that claims to have known her brother and wants to help Eleanor if she’ll grant him his freedom. Dennard does a good job of keeping the reader guessing as to whether or not we should trust Oliver, while beefing up the supernatural mythos with Eleanor’s struggles to control her own burgeoning powers. She craves the feeling of empowerment she gets when she uses her necromancer abilities, but wars with herself about whether this hunger for potential is a gift or a curse. Of course I also loved seeing Daniel’s re-introduction in to Eleanor’s life (particularly after the juicy novella, A Dawn Most Wicked), and their differences that hold them at arm’s length from one another makes my heart do loop-de-loops. Eleanor and Daniel’s relationship reminds me of one of my favorite unconventional, galactic romances: Han and Leia. They’re both so darned stubborn and I love the witty banter between them; Dennard’s dialogue pops right off the page. I can’t wait to see how Eleanor continues to evolve in the next book, as she learns how to thrive under the mantle of responsibility that is entwined with her newfound independence.